With such a focus on process, materials, people and machinery, many companies overlook the critical importance of their production facility layout. 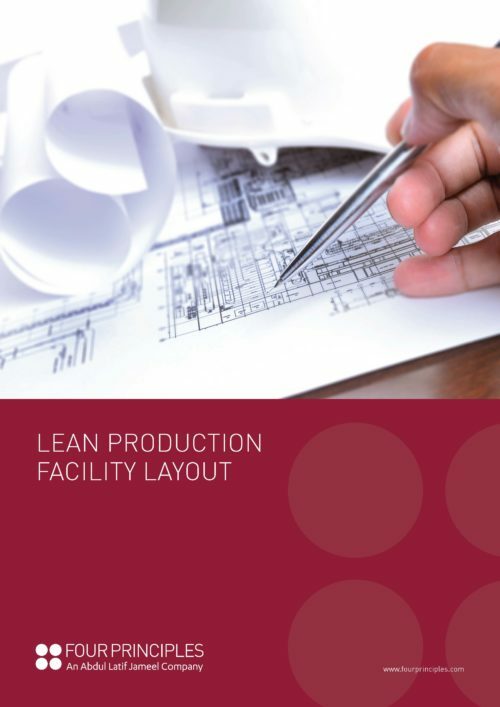 At Four Principles, many of our most significant Lean implementations have brought facility layout into sharp focus, establishing an enhanced layout as a springboard for further improvements throughout the value chain. Many companies also fail to appreciate that, as with other functions, layout is a dynamic, evolving aspect of their operations. Continuous modification and improvement is essential to ensure that the working environment is optimised to the ever-evolving needs of the processes it houses. A poor layout causes waste in transportation, handling and movement between workstations; it gives rise to delays and, in the case of overcomplicated storage systems, unnecessary processing. Often, when production improvements are planned, little thought is given to how these may impinge upon – or be influenced by – the layout of existing facilities. An existing facility may restrict the ability to achieve an optimal layout or, conversely, it may suit current requirements but lack provisions for future expansion or changes to the product mix. When layout planning is undertaken, it may be carried out by people lacking the necessary expertise. Other factors include the knock-on effect of poor preventive maintenance and resultant machine breakdown, which can crowd the shop floor with more machines as the company attempts to keep pace with demand. Whatever the case, the key is a bespoke, tailored Lean solution that addresses the specific nature of any given facility and reduces or eliminates all unnecessary waste inherent in the working environment. Four Principles bring a balanced, scientific approach to facility layout that gives a fully rounded view of the challenges and a tailored Lean solution to match.